When a roofing contractor arrives to inspect your roof and work up a price quote, make note of their appearance. If they aren’t clean enough to sit at your table, do you really want them working on your project? Make sure they understand all of your expectations. Know who will be doing the work and who their foreman is. As always, you should get everything in writing. If you’re impressed, it’s time to check that they have sufficient workers’ compensation coverage and an adequate amount of liability insurance. Get their insurance company’s name and ask to see their proof-of-insurance certificates. Once you’ve confirmed them, then its time to talk about the quote, which they should work up for you for no charge. Get warranties that covers leaks, flashing failure and any other labor-related problems. A one-year warranty is the absolute least you should have. Two or three years is what you should request. These same conditions should be in the agreement, also including what type and quality of materials will be used. Request the highest-rated, longest-lasting materials you can afford to pay for. Manufacturers usually warrant their products for 20 to 30 years. Some warranties can be voided if shingles are put on over existing shingles, so tearing off the existing layer might be a requirement, at additional costs. Asphalt shingles last 13 to 15 years on average, so a 20-year warranty should be adequate. Tiles can last 30 to 40 years, metal even longer than that. Just be sure to get the proper paperwork and proof of purchase needed, in case you have to pursue any problems down the road. A new roof is a large investment that can be many thousands of dollars. The materials you use will represent a small part of your investment. Most of it goes toward the trained and skilled labor involved. That makes picking an experienced, professional roof installation contractor the easiest way to ensure the ROI on your investment and get a proper job completed. Easy? Unfortunately, roofing is a business that doesn’t require more than a pickup, a ladder and some pretty basic tools to get started, so you have to be careful and do your research in picking the right one for your property. If you can get a positive referral from a friend, acquaintance or neighbor, its the best way to go. Get the names of at least three prospective contractors. Be sure they’ve been in business five years or longer — roofing companies that do poor work usually don’t last long. Check their availability. There’s no reason to waste your time if they’ve got projects out several months. Get names, addresses and phone numbers of references, and eliminate any contractors that hesitate or can’t give them to you. Next, drive-by and inspect some of their recent projects. 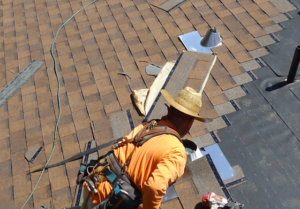 Visually ensure that the spaces between individual shingle tabs, known as water gaps, line up perfectly straight as they alternate shingle rows. Be sure the shingles are trimmed in a clean line along the valleys where they overlap flashing. On the roof ends, shingles should also be neatly trimmed, aligned with the edge of the roof. Ragged lines equals poor quality work. 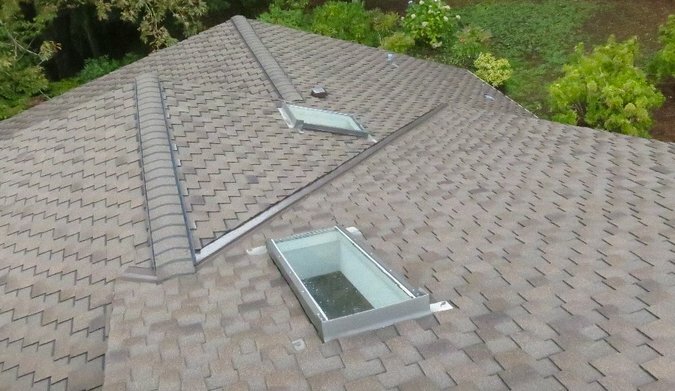 Also look for neat, tar-free flashing at the roof valleys and eaves. You need to interview several roofing companies so you can figure out an honest and reasonable price range that you’ll need to pay. You don’t want to make your final hiring decision based on a few hundred dollars for a project that could cost several thousand dollars, but you should be careful of any extremely low or extremely high estimates. This will also give you plenty of opportunity to build rapport and trust with the contractor you hire and to stick to the other rules for hiring a roof contractor. Besides interviewing several different roofing companies, it’s also important to do some research on the contractor you ultimately choose to hire. Reputable, honest contractors will be licensed and willing to provide you with at least three references verifying they do good work. After you’ve checked your roofing contractors out and you’re satisfied that they’re legit, hiring a roofing contractor will be much less stressful. Never sign a contract or agreement without reading it over very carefully. Professional contractors won’t be bothered by you taking the time to read through and understand the terms of your agreement, and most will be happy to sit down with you and explain anything you don’t understand. You also need to make sure you understand the warranty that comes with your new roof. All materials and workmanship should be guaranteed for at least 5 years, and the roofing itself ought to come with a 20- to 40-year warranty. Before work begins, make sure to cover your bases. Check with your contractor about whether you need to acquire a permit or not (most roofing companies will take care of this as part of their service), and make sure their employees are covered by workers comp insurance. Finally, if you’re submitting an insurance claim on your roof, make sure you’ve followed all the necessary procedures and had all work approved before work on your new roof is started. Never pay the entire balance of your new roof upfront or in advance. This goes for any large project. If your contractor requires this, DO NOT sign the contract. Asking for a deposit as a good faith offering or a payment schedule that goes along with the work are fairly common and accepted practices. Either way, if you can, don’t pay with cash or check. Using a credit card increases the chances that, in a worst-case scenario, you can recover your money without going through expensive legal proceedings. Get at least 3 recent past customers and 3 customers from more than 3 years ago from the contractor and call them all. The recent ones will tell you about their current customer relations and quality of installation and the customers from several years ago will tell you how well they handle long term relations and customer service issues as problems arise, as they inevitably will with a new roof. Also, check the company’s online reviews and rating at the Better Business Bureau. This should give you a good idea of any red flags the company may have with unresolved recent customers. Better to be safe now than sorry later. Of course, there is no magic system for hiring the right roofing company. To have us schedule a free, no-obligation consultation about your new roof, give Armadillo Roofing & Exteriors a call at (512) 333-7663.